The SportsStuff Booster Ball is an innovative water sports accessory made to change the way your inner tube rides. Even the finest towables run into some issues on the open water, like drag and stress on the tube and cover, or whiplash, submarining and rope spray. 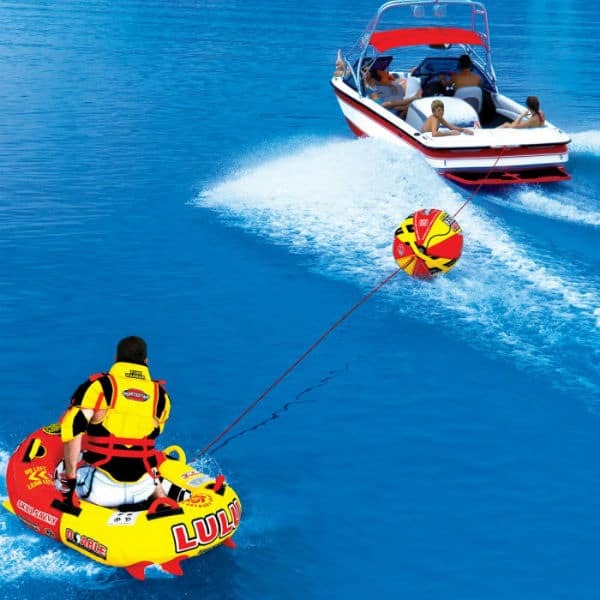 The Booster Ball is attached midway between the inner tube and the towing boat in order to halt some of these problems. In the end, you’ll find that your inner tube performs better than ever before. It’s an economical choice, as you’ll enjoy a heightened longevity of inner tube and inner tube cover and enjoy an enhanced fuel economy. And it makes for a better tubing experience for riders, spotters and the driver. The Booster Ball acts as a barrier for snap backs and whiplash, reduces drag, reduces the phenomenon of submarining, prevents rope spray, absorbs shock, and increases the visibility of the towing rope. Give your inner tube the leg up it needs to perform better and last longer. The Booster Ball can help!